Log cabins appeal to the urban dweller’s desire for a country haven where they can enjoy a respite from the hectic pace of city life. However, most log cabins, if not situated in broad daylight with large open windows, can feel dark, dreary and out of step with today’s standards in interior design. 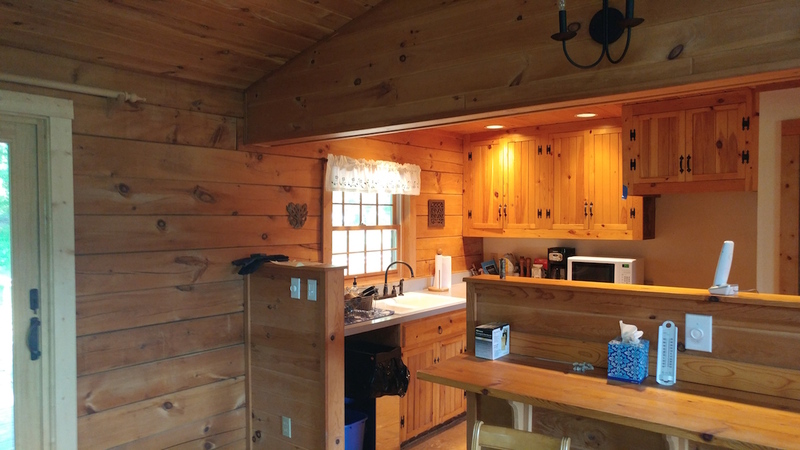 It is for these reasons that my clients, D.C. residents Ariane and Eddie, had become disenchanted with the log cabin home they had purchased as a weekend getaway for themselves, family, and friends. At our first meeting, I was greeted with the kitchen you see in the “original” photo on this page: an overwhelming red tonality that dominated the space. Ariane was having difficulty working around the “redness” with decor and did not understand why. 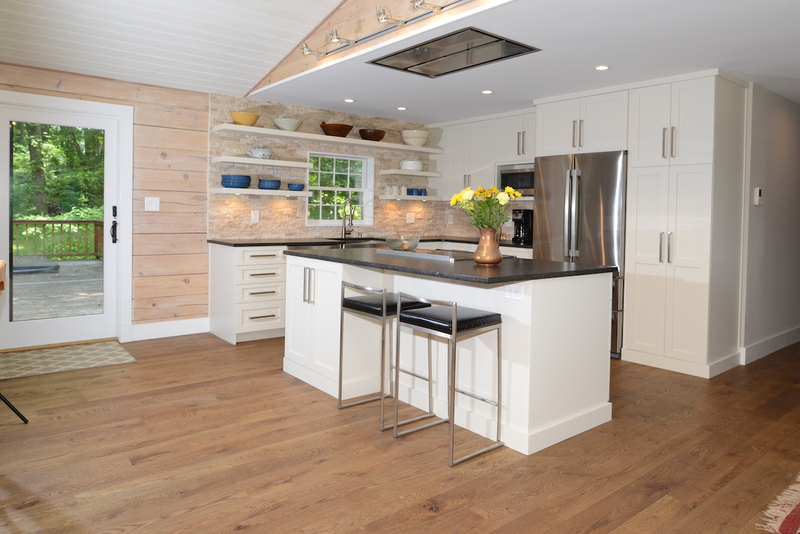 I began my design consultation as I always do, with a series of questions designed to elicit clarity about their lifestyle, their tastes, and their remodeling goals. Their answers all landed in a place of “We don’t know, we cannot get this place to feel right”. When I pointed out what I perceived to be the “problem”, they immediately understood. The main focus then became planning a change for the cabin walls and floor as these two elements dominated the feeling of the space. We began by selecting a gray white color from the wood stove’s stone backdrop. We picked a Minwax white stain, and after a light sanding, this was applied sparingly to all exposed log walls. For the floor, we picked a random wide plank white oak floor. From several sample stains, we picked a medium brown stain which contrasted nicely with the walls. The kitchen was opened up by eliminating the bi-level peninsula; in its place we installed an island that housed an induction cooktop range with a Best by Broan “Cirrus” hood. The hood’s installation is recessed in the ceiling which allows the kitchen to be fully open without obstruction. 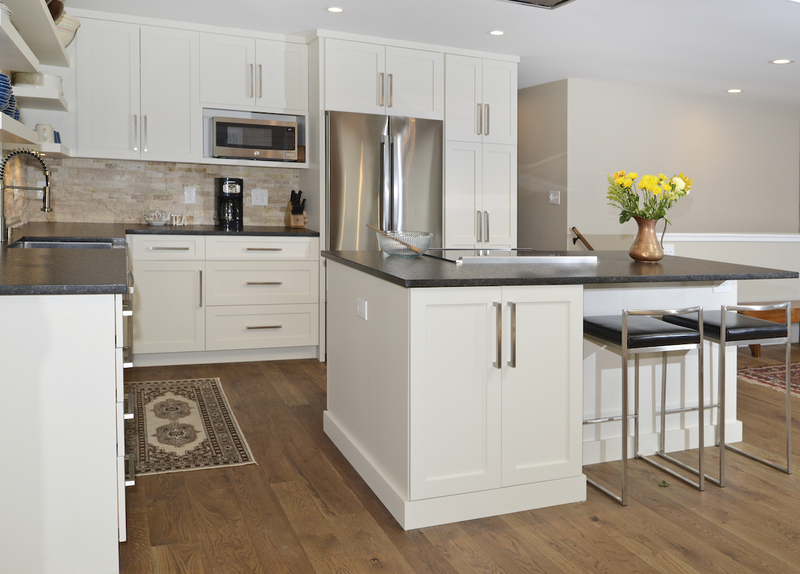 For cabinetry, ubiquitous Shaker style cabinetry was picked in Sherwin Williams “Natural Choice”. Shaker is considered by some to be mundane, but its popularity with most is because of its timelessness–mainly, its flexibility to shift in style slightly by simply changing the decorative hardware. Black Pearl Leathered Granite added a nice contrast to the cabinet color and the sandstone ledger backsplash. The idea of floating shelves on the sink wall were met with resistance initially by Ariane–but she then understood their purpose: to house decorative but useful items while allowing more light to enter the kitchen on both sides of the window. 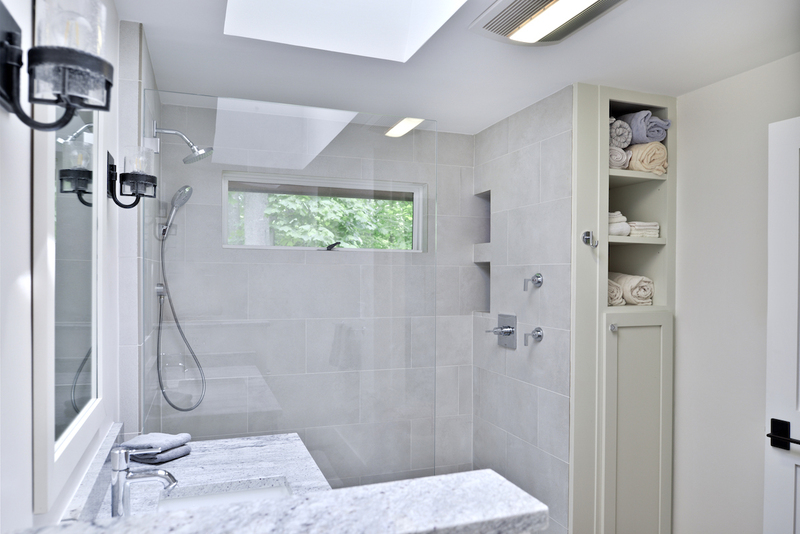 Under-cabinet, recessed ceiling, and track lighting were installed as well–ensuring that the space was bright under all conditions. 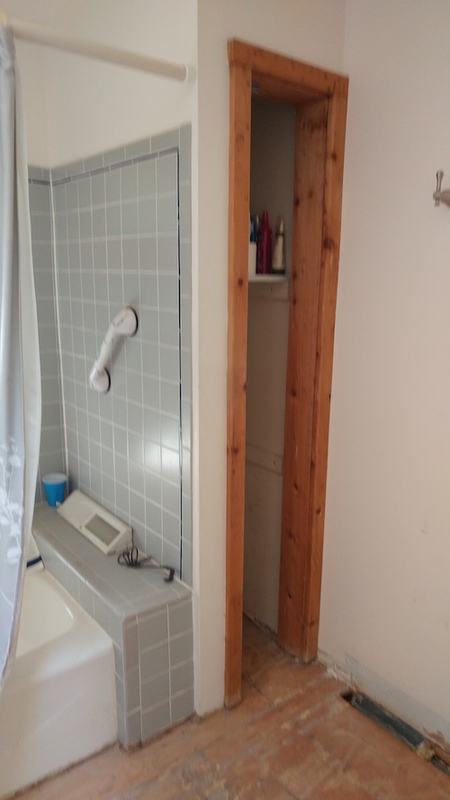 The bathroom offered its own set of challenges. First and foremost, was the most disgraceful of all: when you entered the bathroom, the first thing “staring” back at you was the toilet. It sat right in the middle of the room! Initially, Ariane thought the only item that needed to change was the vanity. “Just replace it,” she said. I told her point blank what I thought: the entire bath needed to be gutted and redesigned. She and Eddie agreed. The rest fell into place. 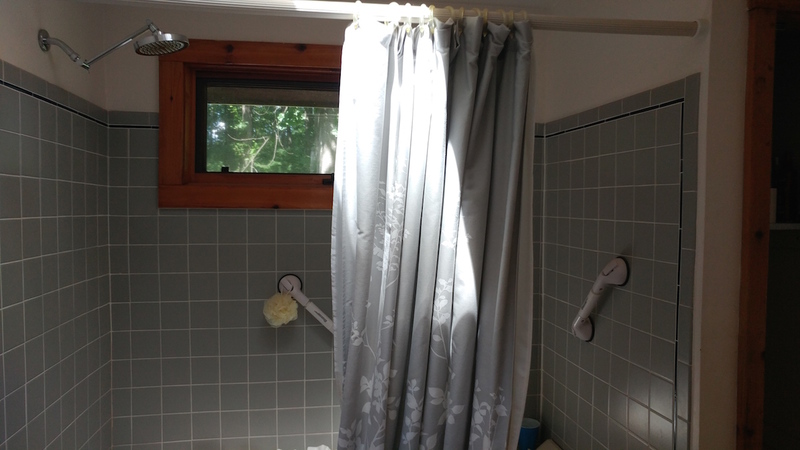 We shifted the toilet to where the vanity was and vice versa, added a kneewall to create privacy for the former, and reconfigured the shower to today’s standards. 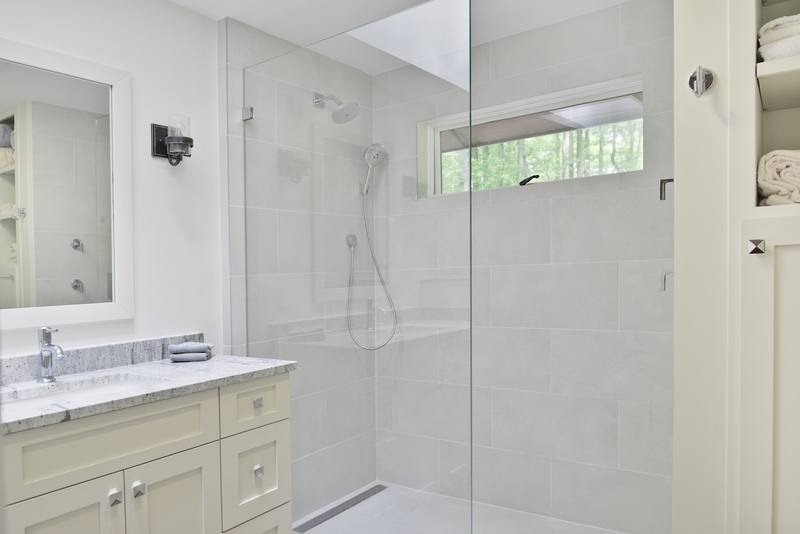 We created niches in the shower, with easy accessible storage on the other side outside of the shower for linens and toilet paper. All and all, a worthy transformation, don’t you think?